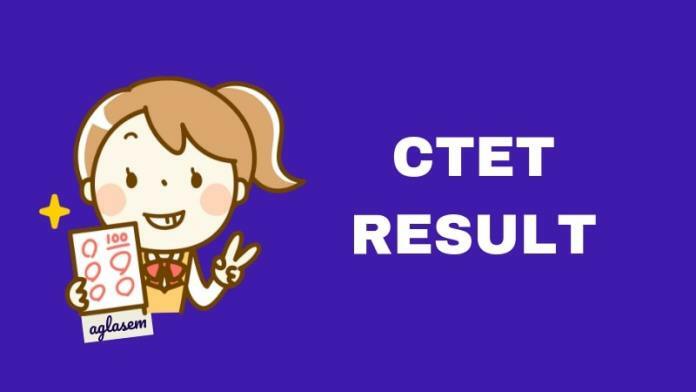 CTET Result 2019 – Central Board of Secondary Education publishes result of CTET exam. Candidates who appeared in Central Teacher Eligibility Test on July 7, 2019, can check their result online at ctet.nic.in and cbseresults.nic.in in July / August. Login with roll number to check Paper 1 and Paper 2 marks, percentage. If you get 60% and above marks (90 out of 150) then you are CTET qualified and you get CTET qualifying certificate that is valid for 7 years. Get here complete details of CTET Result 2019 including date of result, direct link, how to check, cut off, pass percentage. It is important to qualify CTET exam in order to become eligible for teacher recruitment. Qualifying Paper 1 makes you eligible to teach classes I to V, and qualifying paper 2 for classes VI to VIII. First and foremost, important dates related to CTET 2019 Result are as follows. Result is announced by CBSE ctet.nic.in and hosted by NIC at cbseresults.nic.in. Check here: Candidates can check CTET 2019 Result at ctet.nic.in and cbseresults.nic.in as per schedule. Central Board of Secondary Education has not disclosed the exact date of result announcement. As per the brochure, result will be out within 6 weeks of exam. Therefore August 18, 2019 is the last date by which result should come. Actually, result should come even earlier. Let us take a look at the previous records to predict a date. Therefore result can anytime between 26 – 50 days after exam, and 1 week – 3 weeks after answer key. However the recent records of CBSE show that it has started publishing results earlier, rather than later. Hence high chances of CTET result in first week of August. You need to score 60% marks or more in order to qualify the CTET exam. The cut off is same for Paper 1 as well as Paper 2. FAQ 1. If I miss by 1 or 2 marks, am I still not qualified? Answer: Unfortunately, if you missed by 1 or 2 marks, even then you are not qualified. Your score in CTET exam should be equal to at least the cut off score fixed. A strategic process, as given below, is in place for checking of papers and evaluation of the same. Candidates mark answers in OMR sheets. Then these OMR sheets are scanned and answers recorded. Candidates can check their recorded responses along with CTET answer keys at ctet.nic.in. Then candidates challenge the provisional answer key. An expert committee checks the questions on which objections are raised and creates a final answer key. Then candidates papers are checked against the final answer key of CTET. Candidates get 1 mark for every correct answer. On basis of this, result of CTET is announced. Candidates can separately get recorded responses copy and calculation sheet from the board by paying Rs 500 in form of DD, in name of Secretary, Central Board of Secondary Education. CBSE activates a login to check CTET Answer Key, OMR Sheet, and to challenge them. By logging in using roll number and date of birth, candidates can download answer key of their question paper set. You can get all answer key PDF files at AglaSem. Click here for CTET 2019 Answer Key. CTET 2019 Answer Key contains correct answers of all questions asked in exam. It is released separately for Paper 1 set wise, and Paper 2 set wise. The official answer key is issued before result. Final answer key is issued after result. As soon as CBSE announces CTET Result, a link to check it generates on the official site ctet.nic.in. You can result of CTET exam from there or directly go to website of CBSE results. Use the steps below to check CTET Result 2019. Step 1 – Visit ctet.nic.in. Just below the introduction to CTET, link to check result can be seen. Click it. You are taken either directly to login page or cbseresults.nic.in. If you have reached the latter, then navigate to CTET result link there and click it and now you will be on login page. Now enter your roll number, same as was in admit card of CTET 2019. 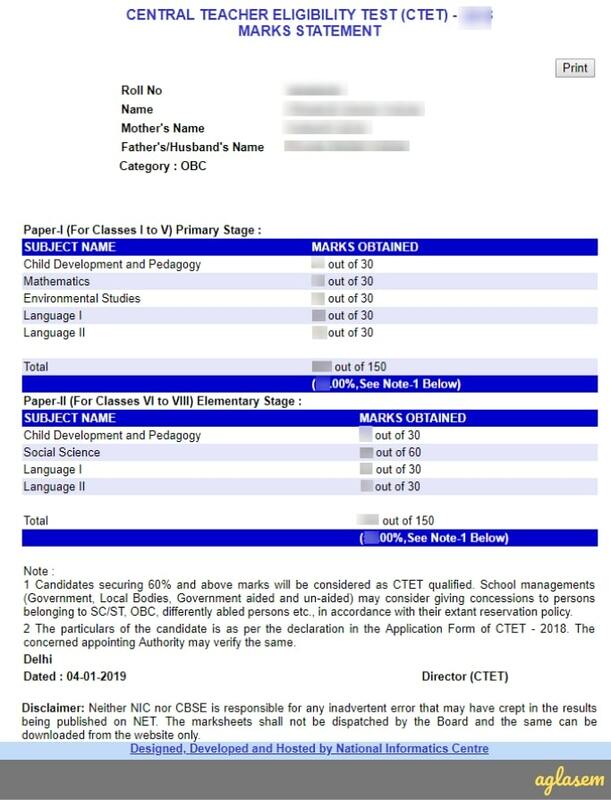 Your result of CTET 2019 displays on page. You can print it as mark sheet. Later on, you can also download it from DigiLocker. The board evaluates machine – gradable answer sheets extremely carefully. There are multiple checks and repeated scrutiny. Therefore the board does not entertain requests for re-checking or re-evaluation, or scrutiny of OMR sheets. Options other than CTET – CTET is the largest national level teacher eligibility test. If you do not qualify it this time, do not worry, you can try again. Other than that, you can also try appearing in any of the state level teacher eligibility tests. CTET Certificate & How To Get CTET Certificate? If you get qualifying cut off marks, then you are CTET qualified. And if you are CTET qualified, then you are issued the eligibility certificate. Now all candidates can download CTET certificate from Digilocker. Follow steps given below. Install Digilocker app in your phone. Navigate to CBSE (Central Board of Secondary Education). Click on Teacher’s Eligibility Test Certificate. Your CTET Certificate gets downloaded. CTET certificate is valid for 7 years from the date of declaration of result. This is applicable for all categories and both papers. Furthermore, there is no limit on the number of times a person can attempt CTET exam. What to do after CTET? Available jobs after qualifying CTET? As a CTET qualified person, you can apply for teacher recruitment. Teaching jobs are available in government as well as private sector. Also, there are permanent and contractual jobs. In most government school teaching jobs, one has to go through exams and/or interviews. These exams are also along similar lines of CTET. You can keep an eye on employment news, newspapers, AglaSem, youtube channels to be aware of upcoming and ongoing teacher recruitment. The examination was first held in 2011 and more than 7.5 lakh candidates appeared for the exam. In that year, only 9% qualified for the exam. The pass percentage as per CTET Results of the last exams are indicated below. If you have any query on CTET Result 2019, please ask in comments below.